Many highly coveted species share a habitat preference for Maine's boreal forest, which is characterized by lots of spruce trees. The boreal forest is spread widely through Canada, but it also nudges across the border into the United States. Maine is particularly fortunate because the influence of the ocean, mountains, and boggy wetlands creates ideal conditions for this habitat. These northern forest species are particularly coveted by birders and they are often in close proximity to each other. However, each is particular about the kind of conditions it prefers, and knowing these preferences improves the chances of finding one or all of them. 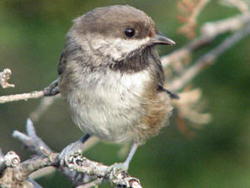 Boreal Chickadee: In the east, this species reaches its southern limit in Maine, New Hampshire, Vermont, and New York. It has an extensive range in Canada. It overlaps with the Black-capped Chickadee and they often forage together. The key: They like their spruce stands short and thick, preferably impenetrable. They do react to pishing and, when birding in a thick spruce area, pishing out Black-capped Chickadees sometimes brings a Boreal, too. Along the downeast coast, they can be found in thick spruce areas of the maritime forest. They are common in the red spruce zone of mountaintops, as well as the lower elevations of the north Maine woods, Baxter State Park, and the western mountains. Like Black-capped Chickadees, they are often heard before seen, and their lazy, wheezy chickadee call is immediately distinctive. They tend to go silent while nesting, making them tricky in June. But they can be very vocal for the rest of the summer while tending young. 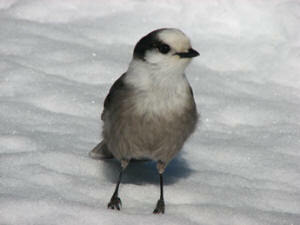 Canada Jay: This tame jay is well-known as a camp robber and will even land on a shoulder to steal food. It is widespread through the Rockies but barely reaches into northern New England. They like all the same areas as the Boreal Chickadees, though they do not extend as far south along the coast. The key: They like their spruce stands tall and thin. They like to perch prominently and glide from tree to tree. They are noisy and curious, especially since their young remain with them into winter. They are drawn to people, and certain picnic areas and campgrounds may even come to expect a visit around meal time. They are widespread in the boreal forests of northern and western Maine, especially above Rangeley. They are in the spruce areas around Moosehead Lake and in Baxter State Park. They are uncommon along the coast, but become more common in the interior areas of Washington County. Black-backed Woodpecker: This unusual species lives in spruce/fir forests and prefers wind-fallen and recently burned areas. Its eastern range barely extends into Maine and New Hampshire. 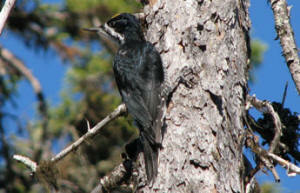 The key: Black-backed Woodpeckers generally feed by stripping swaths of bark from dead and dying trees. They much prefer a disturbed spruce forest. Historically, this disturbance has come from fire or beaver flooding. Mountaintops are prone to winter kill and it's not unusual to find them around summits. Active forestry operations in spruce stands can produce disturbance attractive to them. The woodpeckers are noisy during the nesting season through August, when the chicks finally go off on their own. Their nesting/foraging territory is large, but they leave a lot of evidence of their presence. Look for patches of bark stripped from dead trees. They also flick the top layers of bark off spruce and red pine, leaving a reddish mark that lingers as a telltale sign of their presence. 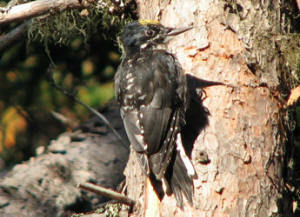 American Three-toed Woodpecker: This rare Maine breeder is difficult under any circumstances. As the most northern breeding woodpecker on the continent, it occupies much of Canada's boreal forest, dipping across the border in northern New England, and ranging far into the Rocky Mountains at higher altitudes. In recent years, they have popped up sporadically in some of the spruce tracts in far northern Aroostook County. They tend to be less noisy than their close cousins, the Black-backed Woodpeckers, and seem to prefer large tracts of black spruce, especially in damper terrain. They are present in Baxter State Park and the logging roads west of the park. They do not appear to compete with Black-backed Woodpeckers, and they seem to tolerate each other's presence. Once located, they are often reliable in that location for long periods of the breeding season due to strong site fidelity. They also tend to wander less in the offseason than Black-backed Woodpeckers do. Bicknell's Thrush: This bird did not even exist as a separate species until 1996, when it was split from the Gray-cheeked Thrush. It can only be found in the highest elevations of the Northeast, usually above 3000 feet. Because of its remoteness, many avid birders have not yet seen this prized species. As alpine birds, they tend to arrive on their nesting grounds late and leave early. They have a tendency to sing only at dawn and dusk, making it particularly difficult to hear, since a mountain ascent or descent may be required in darkness. It can be found atop Maine's western mountains and Baxter State Park. The key: Their call notes are loud and carry well in the mountain air. The most reliable opportunity in Maine is to hike up the ski trail at Saddleback Mountain near Rangeley. 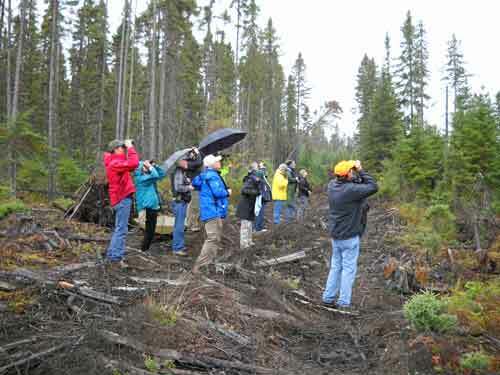 It will require a pre-dawn climb, but birders may be rewarded with a multitude of boreal birds and warblers in the spruce zone. 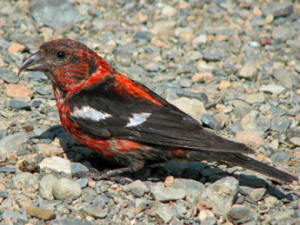 White-winged and Red Crossbills: These species are irruptive. In years when Maine's cone crop is good, they may be found easily in winter and many will linger to breed in summer. In some years, poor cone production in Canada and a good year in Maine will lead to a huge invasion of both species. In other years, they may be completely absent. Look for them in all the usual heavy spruce areas Downeast and in the Baskahegan Lake area of interior Washington County, in Baxter State Park, above Moosehead Lake, through the Carrabassett Valley area, and through the Western Mountains from Rangeley to Bethel. They even reach some of the offshore islands. In a winter irruption, they may range all the way into southern Maine. The key: Exceptionally noisy. Both emphasize a jip-jip call while flying and feeding. Often heard before seen. Yellow-bellied Flycatcher: This Empidonax flycatcher is surprisingly common around bogs and mountaintops, and is possible in any boreal habitat. Like most of Maine's flycatchers, it is noisy from late May through mid July and readily located by voice. It is found in the taller trees around bogs, but usually not in the bogs themselves. The key: Be familiar with the call note as well as the song. 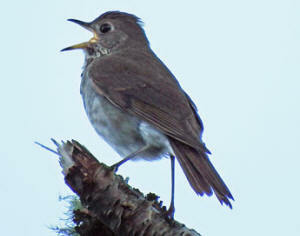 The song is similar to the Least Flycatcher's che-BECK, but is a trifle slower and less insistent: tuh-VECK. The rising chu-WEE call is distinctive. Curious birds will approach quietly and shyly - more so than other empids such as Alder and Least Flycatchers. Olive-sided Flycatcher: This tyrant dominates open areas around bogs and forest clear cuts in northern areas. It can be heard from a substantial distance. It also perches at the tops of tall dead snags where it can be seen easily, often flying out to grab an insect and returning to the same spot. The key: Be familiar with both its Quick Three Beers song and its Pip-Pip-Pip call notes. It can call either vocalization at any time. Lincoln's Sparrow: This shy, secretive bird is widespread through the bogs and wet meadows of the mountains in the western US, but barely reaches into Maine, NH, Vermont and New York in the east. Although they commonly breed in Maine bogs, they also nest regularly where forestry operations have cleared roadsides in boreal regions, especially in damper areas. In May and June, they react vigorously to pishing and will perch in plain view to scold. The key: A very reliable place is the Orono Bog Walk just north of the mall in Bangor. They are often seen flitting through the low vegetation. Fox Sparrow: A relatively widespread boreal breeder throughout the northern half of Maine, it can be found on many of the taller peaks around Moosehead Lake as well as lower elevations. It is particularly common in the boreal section of Baxter State Park above Nesowadnehunk Field Campground. It's a very vocal songster, singing from high perches. The key: On its breeding grounds, it's easy to see when singing, very difficult to find when it's not. Blackpoll Warbler: This is one of many, many warblers that breed in Maine, but it is harder to find throughout the rest of the US because much of its migration takes place over ocean. It prefers alpine spruce forests and is easy to find on most peaks above 2500 feet. But it can be found also at lower elevations. Other lower elevation spots include the park road in Baxter State Park and many of the logging roads above Moosehead Lake. Bay-breasted Warbler:Closely related to the Blackpoll, it occupies similar habitat, although it is more tolerant of mixed forest. Like many boreal warblers, its proliferation often depends on the spruce budworm. Its cyclical outbreak provides an abundance of food. Bay-breasted warblers are easiest to find in Baxter State Park from Katahdin Stream Campground to Trout Brook Farm Campground, but it is widely distributed in the same zones as Blackpolls. 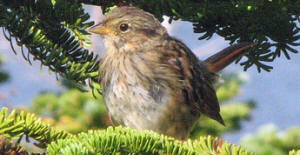 Cape May Warbler: A decidedly boreal species, its population also rises and falls with outbreaks of the spruce budworm. Although it is a widespread breeder in northern Maine, it is difficult to locate. Stay alert in boreal habitat, as its song is thin and unremarkable. Unlike other boreal warblers, it spends more time in the open. Tennessee Warbler: This bird seemingly pops up anywhere in northern Maine, even in habitat that isn't extraordinarily coniferous. It becomes more common the farther north one goes in the state and is rather ordinary in Aroostook County. Upon first arriving, they can be frustrating. They will sing while foraging and resist all attempts to get their attention. They nest rather late, so a pish they ignored in early June may be readily challenged in early July. Mourning Warbler: There is nothing easy about finding this Maine breeder. It prefers tangled brambles in areas that are re-generating from disturbance - often logging in coniferous areas. It is secretive and reluctant to show itself, but its short songs and call notes are louder than most warblers, aiding birders. It breeds over much of northern Maine, but most of the sightings actually occur in migration when it is seen moving through southern Maine in May. Palm Warbler: It is practically a picnic table bird during winter in the southern United States, but try to find one when you need one! The Palm Warbler floods the state in the spring, among the earliest to return, and then melts into its preferred bog habitat. It is familiar in the boreal areas of working forest, especially where logging has thinned large tracts. It sings right through the summer on the back side of the Orono Bog Boardwalk near the Bangor Mall. Downeast: Many of the coastal trails through the spruce-fir maritime forest are productive. The Nature Conservancy trails on Great Wass are very good. 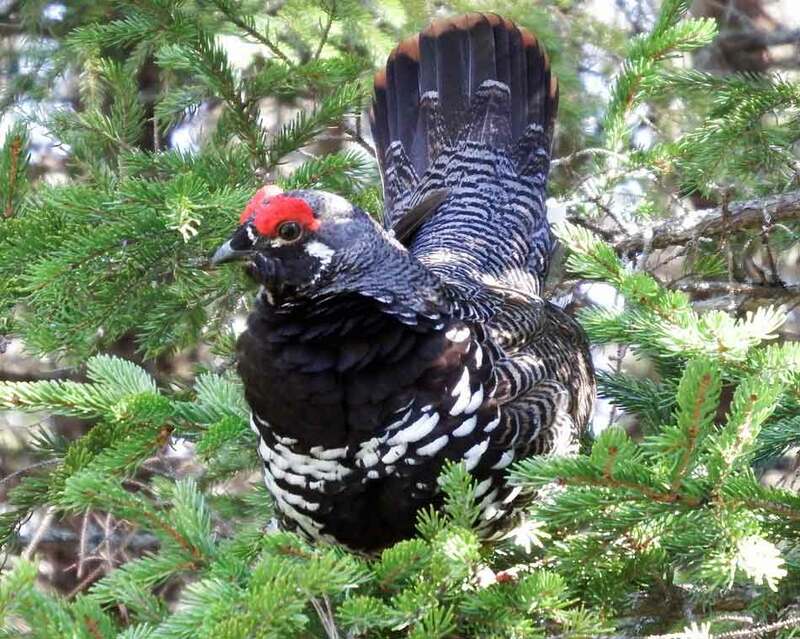 The Maine Coastal Heritage Trust trails on Western Head and Boot Head have Spruce Grouse and Boreal Chickadees. The Bold Coast Trail in Cutler is noteworthy. At Quoddy Head State Park, Boreal Chickadees are sometimes encountered adjacent to the parking lot. In interior Washington County, the private timberlands around Baskahegan Lake are famous for boreal species, but should be avoided during active forestry operations. Timber harvesting seldom takes place on Sundays. Katahdin: Baxter State Park is full of boreal habitat, though much of it is at elevation. Along the road, mixed boreal habitat extends from Katahdin Stream Campground through Nesowadnehunk Field Campground to Trout Brook Farm. The four mile stretch above Nesowadnehunk Field is particularly boreal. Moosehead Lake: There are many pockets of boreal habitat surrounding the lake. The B&A Railroad Bed North road from Greenville Junction to Shirley is rough but worthy. Big Moose Mountain is a moderate climb with significant rewards in both birds and view. (Bicknell's Thrushes are on top.) Boreal habitat is abundant just north of Kokadjo and is impressive over the four-mile approach to AMC's Medawisla sporting camp on Second Roach Pond. Route 6/15 from Rockwood to Jackman is strongly boreal in places, though road traffic is fast and loud. North Maine Woods: This fee area is Maine's premier working forest. Public access is encouraged, but make sure to get good maps and info at the entrance gate. Large boreal stands are present throughout the North Maine Woods and every trip is an adventure. Carrabassett Valley: The area around Bigelow Preserve and Sugarloaf Mountain USA ski resort is full of boreal habitat. Any mountain trail will ascend into prime boreal terrain. At lower elevations, the Long Falls Dam Road to Flagstaff Lake is productive. Tim Pond Road from Eustis to Jackman contains many boreal stretches. Also in Eustis, the King and Bartlett Road entrance to the back side of Flagstaff Lake plunges into boreal pockets pretty quickly. Mount Blue State Park: The mountain trail is popular and the summit is very boreal. Also consider the peaks on state public reserve land nearby. Rangeley: This area is riddled with boreal habitat, primarily north of town around Oquossoc and Cupsuptic. A climb up the ski slope of Saddleback Mountain is about as productive as anyplace in Maine, with a chance at Bicknell's Thrush. Route 16 heading east to Stratton is boreal for several stretches not far outside of town. Watch for moose. Grafton Notch State Park: All of the mountains in the area are prime habitat for boreal specialties, but even at road level, the spruce forest at the north end of the park is productive for Boreal Chickadees and Black-backed Woodpeckers. Be sure to investigate for Philadelphia Vireos around the large parking lot for the Appalachian Trail. Aroostook County: The county is so far north that much of it is boreal, particularly the working forest of the North Maine Woods in the western part of the county. Route 11 from Marsardis to Ashland is very boreal, and the lumber roads in the area offer access. Beware of trucks! In Sinclair, near Long Lake, walk a mile or so of the gated access road to the wastewater treatment plant and listen for Boreal Chickadees and Black-backed Woodpeckers.